Jan.5th, 2009, will be the first dig for he multi-functional complex "Sky Buildings" in Plovdiv, by the construction company "Iazov" LLC. 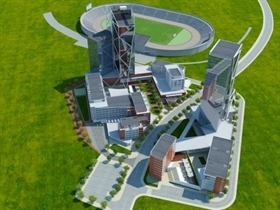 The complex will be located near the Luta Park, right net to the Locomotive Stadium. The complex will feature 21 buildings, including two office ones (of 17 and 27 storeys, respectively) and 13 residential ones.